Where to begin? How to approach an elusive subject such as the history of bugles? The first thing is to find a definition of “bugle.” And as we explore the history of the bugle, it is necessary also to incorporate a history of its sister instrument the trumpet. In both cases we are dealing with a brass instrument without valves, and both are played in the same manner. The basic difference between bugles and trumpets is found in the shape of the bell. The musical definition of a trumpet (natural trumpet) is that of a horn which has two thirds of its length in the form of a cylindrical tube – usually it is five sixths of the total length. A bugle has a conical shape through-out. We can therefore make the general assumption that a trumpet is cylindrically shaped with a cup-shaped mouthpiece, while a bugle is conical in nature with a funnel-shaped mouthpiece. 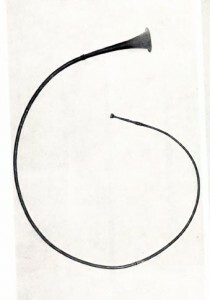 The shape of the bell plus the shape of the mouthpiece produces a different quality of sound in each. The trumpet is known for its bright, strident, brash sound, while the bugle is known for its darker and mellower tone. Today, the term “bugle” can simply mean a brass instrument without valves or slides. 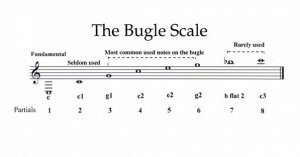 Another shared attribute of the bugle and the natural trumpet is the number of notes they can produce. Natural trumpets and bugles, unlike the modern three-valved instruments today, can only produce a limited number of notes found in the harmonic series of a single fundamental tone. All musical sounds that we hear contain overtones, or tones that resonate in fixed relationships above a fundamental frequency. In Western tradition, we credit Pythagoras with discovering the harmonic (or overtone) series; however, other peoples such as the Egyptians, Chinese, and Babylonians knew of harmonics before he did. Pythagoras discovered that a monochord (single tone) vibrates not only at its fundamental frequency, but also in partial segments – halves, thirds, fourths, etc., to a theoretically infinite degree. The harmonic series are the notes (or partials) that are created when a fundamental note is struck. It is the presence of these overtones that creates tonal color, and that helps us to differentiate the sounds of a harpsichord and a piano, a trumpet and a trombone, or one voice and another. Humans do not perceive overtones much past the fifteenth partial, because as overtones become higher, they become increasingly difficult to hear. The notes that are available in the harmonic series include the fundamental note plus 11 upper partials. The higher the overtones go, the closer in pitch the notes become. As an example, when “Great C” is played on the piano it generates the following overtones: C – c – g – c1 – e1 – g1 – b flat1 – c2 – d2 – e2 – f#2 – g2. The natural trumpet and bugle with the fundamental pitch of c use five notes of the series, i.e. c1 – g1 – c2 – e2 – g2. 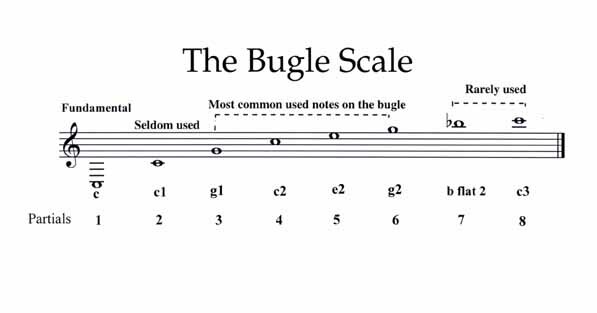 These are the 5 notes on which most bugle calls are written. A sixth note (c3) is found in trumpet music but is rarely found in bugle music. The fundamental note of any horn is determined by the length of its tubing; trumpets are found in keys of C, D, Eb and F, and bugles are found in the key of G, Bb and C.
A natural trumpet or bugle, then, can theoretically play any and all of the tones that are at integer multiples of the lowest frequency with which its tube is capable of resonating. To play these tones on a brass instrument requires a method of vibrating the lips into the mouthpiece to raise or lower the pitch within the harmonic series. (On other instruments of the orchestral family sound is produced by the vibration of strings, reeds or animal skins.) Normally it is difficult to make a brass instrument resonate at its fundamental. 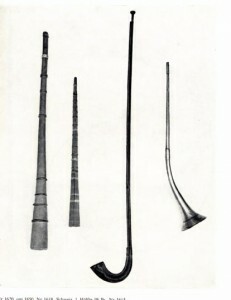 Starting from almost the same original idea (an animal horn), the bugle and trumpet evolved into instruments of different usage. 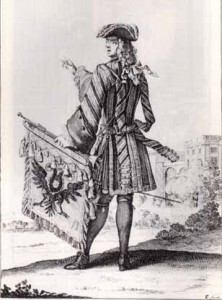 From the bronze and silver horns, the trumpet made its way into the symphony orchestra of the 18th century. The major Classical composers (Haydn, Mozart, and Beethoven) made use of its fanfare qualities, albeit with limited notes, in their symphonies and usually paired the trumpets with the notes of the tympani. The bugle first appears as a hunting horn with the distinctive coil we mostly associate with modern french horns. 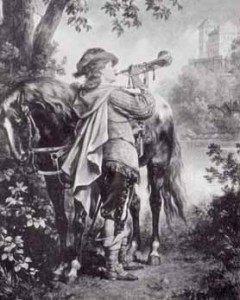 In the late 18th century the bugle then took on the form we know today. Both trumpet and bugle underwent many experiments in the quest to add chromatic pitches to their playable notes. Both added keys in the late 18th century, and later valves in the 19th century. The trumpet became the instrument we are familiar with in bands and orchestras today while the bugle with valves evolved into the modern cornets and flugelhorns. The military has long blurred the distinction between the two and still does to this day. It is interesting to note that today when a brass player is assigned to “bugler duty” that person will show up with a modern Bb valved trumpet to sound bugle calls. Early bugles and trumpets bear little resemblance to those of today. Trumpets can be traced to pre-Biblical times when they were used by Egyptians and Israelites. 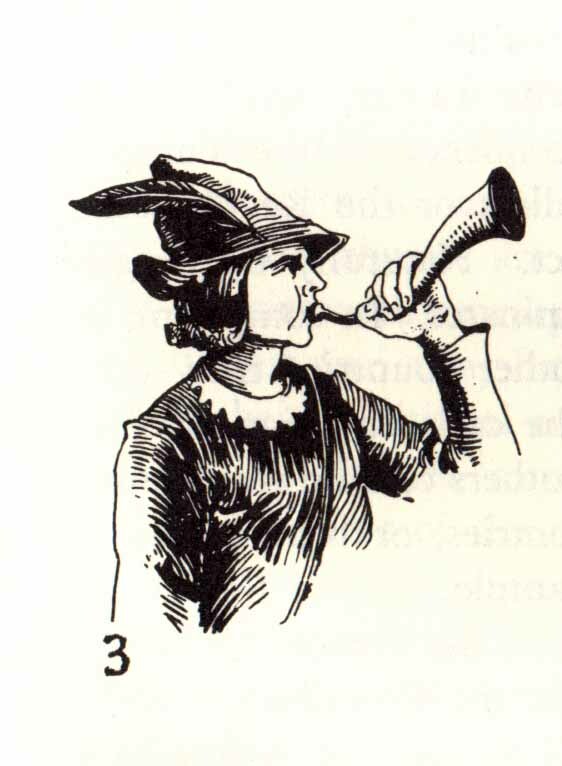 The earliest trumpets were straight instruments with no mouthpiece and no flaring bell. These trumpets were actually megaphones into which one spoke, sang, or roared. The effect was to distort the natural voice and produce a harsh sound in order to frighten evil spirits. Ancient trumpets were used at religious ceremonies and associated with magical rites. Burials, circumcisions, and sunset rites (to ensure the sun would return) were a few of the early ceremonies in which the trumpet was used. It was a male-dominated practice and among certain tribes of the Amazon any woman who looked at a trumpet was killed. The tradition of playing at sunrise (Reveille), sunset (Retreat), and at burials (Taps) may have evolved from these ancient rituals. The Rams Horn (Shofar) is sounded on the occasion of the Jewish New Year in a rite that continues to this day. The Shofar, made from the horn of a ritually killed sheep or goat, is played in the same manner as it was in the time of King David, using the same rhythms as in ancient times. The instrumental range of the Shofar is usually limited to two notes about a fifth apart. The instruments found in ancient Egyptian art are short straight instruments of wood, bronze or silver and are depicted accompanying marching soldiers. 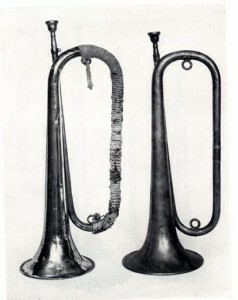 The oldest surviving examples of metal trumpets are the two instruments that were discovered in the tomb of the Egyptian pharaoh, Tutankhamun. King Tutankhamun reigned from about 1340-1331 B.C. which places his life during the Bronze Age. The discovery in the 20th century of these horns confirmed the existence of trumpets during the Egyptian period time as had been seen in many paintings and reliefs. The two instruments have short expanding bells. One is 58 cm. long of silver and the other 94.4 cm. long of sheet bronze, partly clad with gold. According to trumpeter and historian Don L. Smithers, the longer of the two is pitched in the key of Bb and the other is in the key of C.
The ancient Olympic Games in Greece included contests of trumpet playing in 396 B.C. These contests were judged not by musicality but by volume of sound. 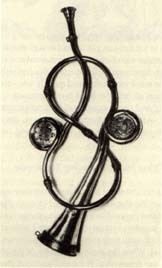 The instrument used by the Greek trumpeters was the Salpinx, a reported copy of which is preserved in the Museum of Fine Arts in Boston. This Salpinx measures 157 cm. and is made of thirteen cylindrical parts made of ivory with a bell made of bronze, as is the mouthpiece. Among famous trumpeters who participated in the games was a trumpeter named Achias (also: Archias), who won three times and to whom a column of honor was erected for his achievement. Another contestant was Herodorus of Megas, whose playing was so loud that many in the audience were stunned by the concussion. He was a giant man, slept on a bearskin, and when playing two trumpets at one time forced the audience to move back due to the force of his immense sound. Passages can be found in the Bible and in early writings of troops being marched to martial blasts and of trumpets used in ceremonial rituals. 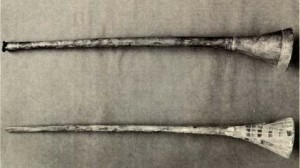 As recorded in the Book of Numbers 10.1-10, Moses was told by God to “Make two silver trumpets; of hammered work you shall make them; and you shall use them for summoning the congregation, and for breaking camp.” The trumpets were also to be used to sound the alarm when the people went to war, in religious ceremonies, and at feasts. 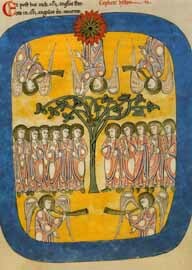 As a fanfare instrument the trumpet was used in celebration of Solomon’s temple with 120 priests sounding the horns, as recorded in II Chronicles 5.12-13. The story is well known of how Joshua had seven priests with trumpets sound and blow the walls of Jericho down (Joshua 6.4). Gideon, in Judges 7.16, also used trumpets to save Israel from the Midianites, who, in one of their forays into Palestine, had murdered his brothers. Gideon gathered 300 men and gave each a trumpet. They crept to the Midianite camp in the dark, and on signal blew all the trumpets simultaneously. The terrified Midianites fled with Gideon behind them. He captured their two kings. There is a story that this tactic was repeated centuries later during the American Civil War. A Union army colonel, James H. Wilson, allegedly used 250 buglers during the battle of Front Royal, Virginia on September 21, 1864. The Union buglers charged the Confederate lines all blowing at the same time. The Confederates broke and ran in full flight. This could be one of those Civil War myths. If anyone has more on this please contact me. 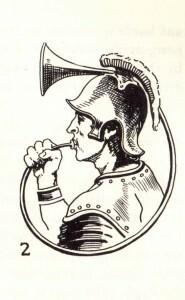 Signal musicians used as an integral part of a military organization appear first in the Roman Legion. 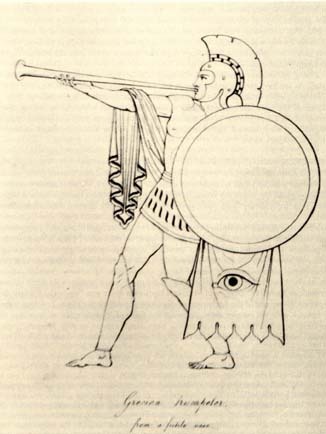 These musicians, called aenatores, utilized a wide variety of trumpets, and signals were sounded on these instruments which the Romans inherited from the Etruscans. The Etruscans were superb metallurgists and smiths, and must have been skilled in the making of bronze or silver trumpets. 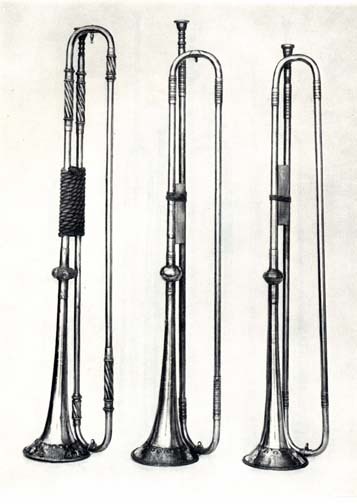 A collection of forty-three signals were used in the Roman Army. Instruments in the Roman Legion included trumpets such as the Tuba which was conical shaped and about 117 cm. long. It was a straight horn that had a slightly flaring bell with no bends. The earliest notated calls can be found in Janeqequin’s composition depicting the French victory at Marignana in 1515. The piece, La Bataille, contains trumpet and drum calls. By 1544, descriptions of the specific trumpet signals used to issue commands were prepared by the British army as it waged its French campaign. 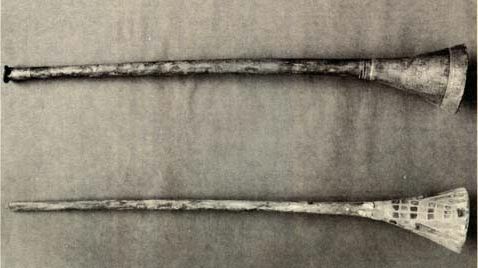 These trumpet signals were used for cavalry while drums were used for the infantry. This entry was posted on Wednesday, February 13th, 2019 at 11:48 am	and is filed under Bugle Stories, Buglers Through History, Bugles for Performing and Collecting, History of Taps, History of the Bugle, News. You can follow any responses to this entry through the RSS 2.0 feed. Responses are currently closed, but you can trackback from your own site.